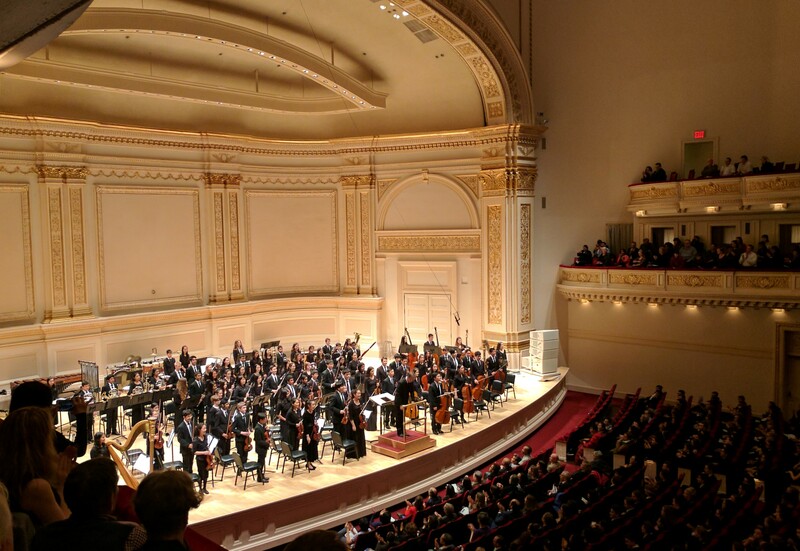 Late March was a special time for the students in the Harker School Orchestra, who headed to New York City to perform at the famous Carnegie Hall as part of the New York Sounds of Spring festival, hosted by World Projects. The March 28 performance consisted of pieces by Modest Mussorgsky, Dmitry Kabalevsky and John Williams. The orchestra also had the distinct honor of debuting a piece by composer John Carnahan titled “Les Bourgeon Du Printemps.” The momentous occasion prompted dozens of Harker parents and several alumni to attend the concert. Students also had the pleasure of attending a clinic conducted by Carnahan, who is the director of bands and a professor of conducting at California State University Long Beach’s Bob Cole Conservatory of Music. Under the direction of upper school music teacher Chris Florio, the orchestra spent months preparing for trip, which Florio had been organizing for two years. Luckily, there was also time to enjoy some of the many sights the big city had on offer. Outings during the trip included a visit to the Statue of Liberty and attending a performance of “Anastasia” on Broadway. Head on over to Harker Aquila for the full story! Audio recordings of the Carnegie Hall performance are available via Soundcloud.